And Charles Barkley and Shaquille O'Neal couldn't stop laughing about a "police presence" after the incident. 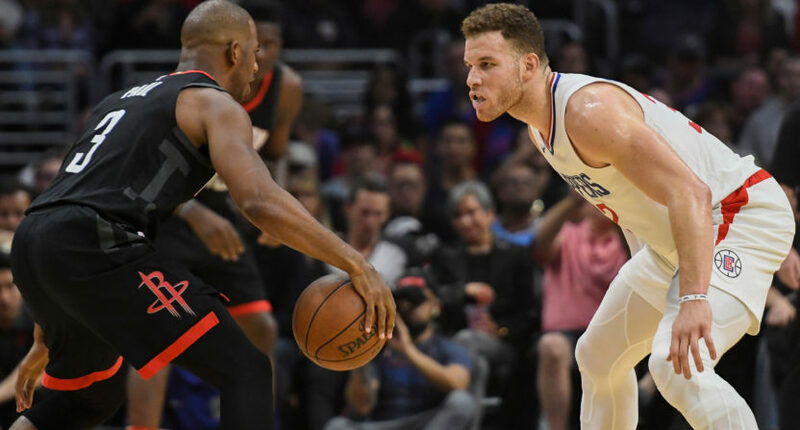 Things got heated late in the fourth quarter of Monday night’s Clippers-Rockets game, which also happened to be Chris Paul’s first game back at Staples Center against the Clippers as a member of the Rockets. With 1:03 remaining in the game, Clippers star Blake Griffin was ejected after having words with Houston’s Trevor Ariza. It appears that Griffin was defending teammate Austin Rivers, who was in a suit on the bench (out with an ankle injury). And after the game, ESPN’s Adrian Wojnarowski reported that Rockets players pushed their way into the Clippers’ locker room and training room, looking to confront Rivers and Griffin. Paul was reportedly one of the Rockets players to enter through a backdoor connecting the teams’ dressing rooms, and Rockets big man Clint Capela was reportedly knocking on the Clippers’ locker room door. Entered through a back door, to be clear. TNT’s Rosalyn Gold-Onwude spoke with the Rockets’ players after the game, who said they didn’t like the Clippers’ attitude and rallied around Paul. 3/3 I spoke w member of Rockets who said "we didn't like their attitude. We are together. We'll see them 2 more times. We'll remember that". And added they definitely rallied around Chris Paul to have his back. Gold-Onwude also mentioned a “police presence” and that made Charles Barkley and Shaquille O’Neal laugh very hard. UPDATE: Some tweets following the postgame drama.